The Camel Trail provides access to some of Cornwall’s most beautiful countryside and coastal scenery and is arguably the most successful trail in the UK. The trail runs from Padstow on the North Cornish coast to Wenford Bridge at the foot of Bodmin Moor near the extraordinary pretty moorland village of Blisland. It is 18 miles long and virtually flat the whole way, making it a lovely day out for all the family. The contrasts in scenery are striking with access to country and seaside towns, and great opportunities to spot wildlife. Visitors can easily hire bikes in Padstow, Wadebridge and Bodmin, or bring their own. Experienced cyclists can make off, away from the trail exploring the many villages and country lanes that lie close to the trail. Padstow has been voted one of the top U.K tourist destinations. From it's unique pretty harbour you can take pleasure and fishing trips, a short walk to Tregirls Beach one of many local beaches. Padstow is at the start of The Camel Trail where you can easily hire bikes.Book a cookery lesson at Rick Stein's seafood school. Have a meal at Rick Stein's famous Seafood Restaurant. 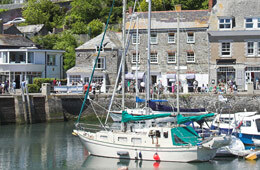 You can also enjoy a meal or drink in one of the many harbourside restaurants and pubs.